The New Year will start with a visit to the Parkinson’s Nurse and time for me to think about what has changed and where I am now. The tremor has not got any worse which is great, not many people would know on meeting me that I had a chronic illness. Tiredness is my worst issue mostly brought on by my poor sleeping problems. We recently had drinks with friends and I managed to doze off in the middle of a gin and tonic, it was only early evening too! Anxiety is a problem for many Parkinson’s sufferers and this is something that does cause me issues and I know I must try to fight this problem. I think it is important for me to try and keep as independent as I can and travelling to London to attend Dance for Parkinson’s classes has been a good opportunity to work out trains/tubes and buses for myself. Sadly we had our last class at English National Ballet recently, tears flowed as we talked of the joy that these special classes had brought us, hopefully the New Year will bring more information about the company’s move to Canning Town. Our last event was to the Coliseum to see Nutcracker, a beautiful production. 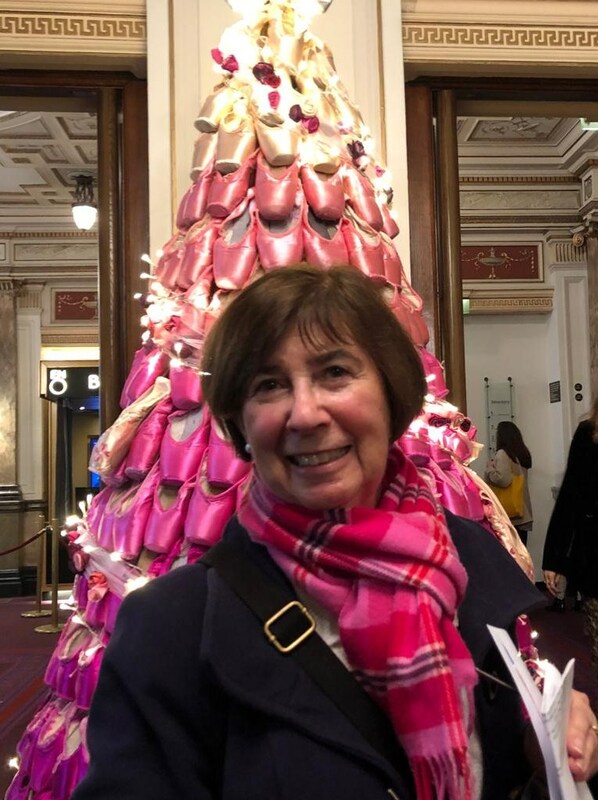 The ballet shoe Christmas tree at English National Ballet. Our choir, aptly named Good Vibrations, sang at a local Christmas Tree festival recently. We have really come quite a way since we first got together and the church acoustics enhanced our performance. We have a fabulous choir leader and jazz pianist which helps us all. 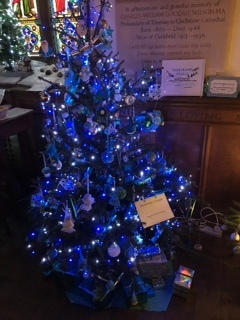 Parkinson’s Christmas tree was one of over 60 at Cuckfield Christmas tree festival. Christmas is all about children and having the the whole family together was very special. Handsome Henry loved opening presents and playing with the wrapping paper. Eighteen months is an age where there is a huge learning curve with language and movement developing rapidly. He has become an expert climber and explorer so careful watching was the order of the day! Soon we will follow him back to Melbourne and some warm sunshine which will be very welcome. Hello Elspath, thank you for the update, always interesting to read. You are doing very well to be at 7 years, it must be all that ballet and singing. You always sound so positive, I often have trouble sleeping and can nod off easily and don’t have Parkinson’s, I wonder if that is age related? Very best wishes to you and your family and enjoy your time away. Receiving your regular comments is like accompanying you on your journey. Thank you. Your positive thinking and way of life are an example to everyone. I’m so glad your Christmas was good. Families are so important and it is great that you are being given so many opportunities to be together. Have fun in the sun.